By HOLLAND EASE SI 109 (1989). Stakes winner of 6 races, $361,227 [G1]. [R], 2nd Speedhorse Gold & Silver Cup Derby [R] [G3], Rocky Heinzig S., 3rd Eastex H. [G3], Sooner State S. [R] [G3], etc. PURE D GOLD SI 102 (c. by Pure D Dash). 4 wins to 4, $30,095, Oklahoma Bred Futurity [R] [G3], 2nd Black Gold 300 Futurity [R] [G3], finalist NM Champ. Chlg. [G1], Oklahoma Champ. Chlg. [G1]. Sire. Mr Gold Streak SI 95 (g. by Holland Ease). 3 wins to 4, $31,376, 2nd Speedhorse Invitational [R], finalist Oklahoma Bred Derby [R] [G3]. Kita Cartel SI 101 (g. by Cartel Willie). 2 wins to 3, $48,479, finalist [G1]. Fols Gold Streak SI 104, by Fol’s Native TB. 6 wins to 3, $82,959, 2nd Pal’s Top Deck Champ., 3rd Fall Fashion S., finalist in the Raton Derby [G3]. 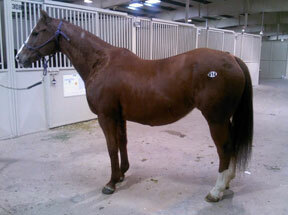 Dam of 8 foals to race, 6 ROM, including– Black Gold Streak SI 86 (f. by Will Win TB). 4 wins to 6, $13,727. KITA REE BOSS SI 102 (Kitaman). 10 wins to 4, $89,032, Rocket Bar Futurity, Mystery Derby, 2nd Boomer Sooner Fall Derby. Sire. Fols Gold Streak SI 104 (Fol’s Native TB). Stakes placed winner, above. RACE RECORD: At 2, twice 2nd, twice 3rd, finalist Lazy E Fut. [R] [G2], Oklahoma Bred Fut. [R] [G3]; at 3, one win, 3 times 2nd, twice 3rd. EARNED $19,535. Rosie is out of a direct daughter of Kitaman, a triple ‘A’ racehorse, sire of world show finalists, halter/ working superiors, ROMs in the arena etc. Maybe best known for siring Leanne Guilky’s great barrel horse/stallion Rackum On Man ‘Kid” who qualified for 4 NFR’s, was Reserve World Champion to none other than Scamper, as a 4 year old ran the fastest time at the NFR etc. The female line of Rosie’s family goes back to the great TB sire Fols Native who shows up in the pedigree of many great barrel horses including Fols Classy Snazzy whom Marlene Mcrae rode to the 2000 NFR. 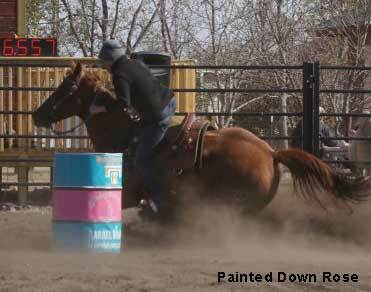 Rosie already has a daughter: Painted Down Rose that’s a successful barrel horse in Minnesota. We feel she’ll make some great arena horses in the future! Rosie's daughter, Molly, is a horse that a person could own 10 of! She is very level headed and easy to train. She is a "want to please" kind of girl. A 1D horse THAT rolls with the punches. My 8 yr old daughter's horse died in December and she has now claimed Molly. The 4th of July fireworks barely phased her; my horse freaked! I thought Molly would be too much horse for Kellen but we are doing okay! If Molly is any indication of what Rosie's other colts will be like, that is a huge plus! Honestly, I wish I was the one running her again!